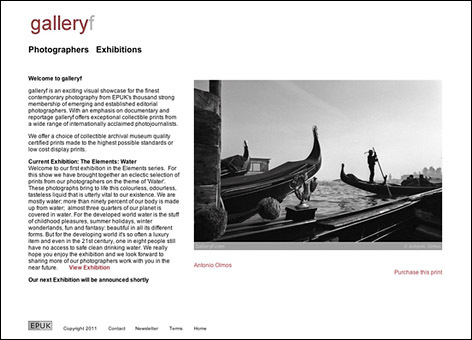 The Elements: Water is the first exhibition on the galleryf online shop now run by Editorial Photographers UK. galleryf showcasing great contemporary photography from internationally acclaimed journalists, has relaunched. The online print sales store now draws on the work of the thousand strong membership of EPUK to offer an unrivalled selection of prints to private and commercial buyers. galleryf: archival museum quality certified prints of EPUK members work. Photo © Antonio Olmos. galleryf’s first EPUK show The Elements: Water, went live on 28 October. It features work by Antonio Olmos, Jenny Matthews, Julio Etchart, Lynn Hilton, Paul Debois, Sarah Lucy Brown, Richard Baker, Jason Bye, Harry Harrington, Dave Wyatt, Brian Harris and David Hoffman. With the emphasis on documentary and reportage galleryf offers a unique and unusual range of images at reasonable prices. All are available as both low cost prints and as collectors’ certified limited edition museum quality archival prints. Just taken a look at galleryf and it seems like a very nicely made site with some really good imagery. Bookmarked in my special photography folder!